Visit a small town "in blue" in the Rif Mountains! Enjoy walking in old Medina. Head for the entrance of the desert, Ouarzazate, through High Atlas Mountains,. Drive through Kasbah Road, stopping by at Todra Gorges. Enjoy camping and great sunrise in the desert of Merzouga. Move to Fez through Middle Atlas Mountains and stay overnight. Drive through a desert and oasis road, with hundreds of kasbahs. Stopy by at Kelaat M'Gouna, the valley of rose. 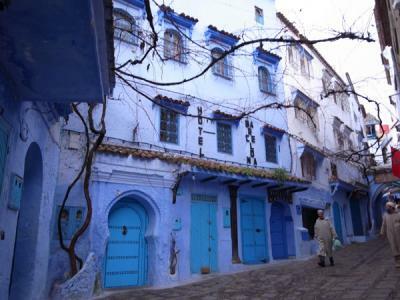 Visit the Medina of ChefChaouen, a small village in the mountains. The houses and shops are painted in mysterious blue, which makes this town famous as "Blue Medina." Visit Bab Mansour, Mausoleum of Moulay Ismail, the only mausoleum open to non-Muslims.